New Foundation Formulations Have Arrived! 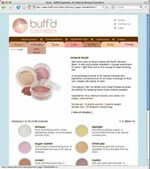 Buff'd Mineral Foundations are now available in three formulations - Light, Original and Concealing. Our new Light Mineral Foundation was formulated specifically for those who prefer a lightweight foundation that still offers buildable coverage and great oil absorption. Formulated with a base of feather-light mica minerals, our Light Mineral Foundations also contain titanium dioxide and zinc oxide, both of which provide significant natural UV protection. All our mineral foundation shades are also now available in a heavier-coverage concealing formulation. Made with a touch of kaolin clay, Concealing Mineral Foundation offers even better coverage with greater oil absorption while leaving your skin flawless and radiant - not dull or chalky. Ideal for those with combination to oily skin, our concealing foundation also works great as a spot concealer. Our Original Mineral Foundation formulation remains unchanged - why mess with a good thing! A great full-coverage foundation with fantastic oil absorption and natural UV protection. To celebrate the launch of our new foundation formulations, all of our full-size products are now on sale at 20% off until July 31, 2008! No promotional or discount codes are needed for this sale which includes all full-size mineral powders, Lipsticks, Lip Balms,Brushes and Accessories. Please Register and Subscribe on our New Website! This will be our last newsletter that we will be sending to our entire emailing list. If you would like to receive future Buff'd Cosmetics newsletters, we encourage you to visit our new website, make an account and subscribe to our newsletter mailing list. Newsletters are sent to clients to inform them when new products and/or shades are being launched as well as any product updates or sales. Client information is kept in the strictest confidence - we do not send spam emails advertising our products nor do we disclose your contact information to anyone else. If you ever want to stop receiving our newsletters you may login to your account and unsubscribe at any time. A new foundation shade has been added to our collection. Cognac is a dark shade with heavy yellow undertones and now becomes our darkest yellow-toned shade.